SCOTTSDALE, Ariz. – On Saturday, San Francisco Giants catcher Buster Posey played in his fifth spring training game and made his fourth start behind the plate. Told that it seems as if he’s catching more than expected coming off hip surgery, Posey agreed. Posey will be in the Giants’ lineup on Sunday as well, but as the designated hitter. It will be the second time he’s played in back to back games this spring. Last August, he had surgery to address a hip impingement and repair a torn labrum. Is there anything he can’t do because of his hip? Giants manager Bruce Bochy has been inserting Posey in the No. 2 spot in the lineup simply to give him more at-bats. The six-time All-Star’s playing time has been determined by how he feels and constant communication with the Giants’ medical staff. 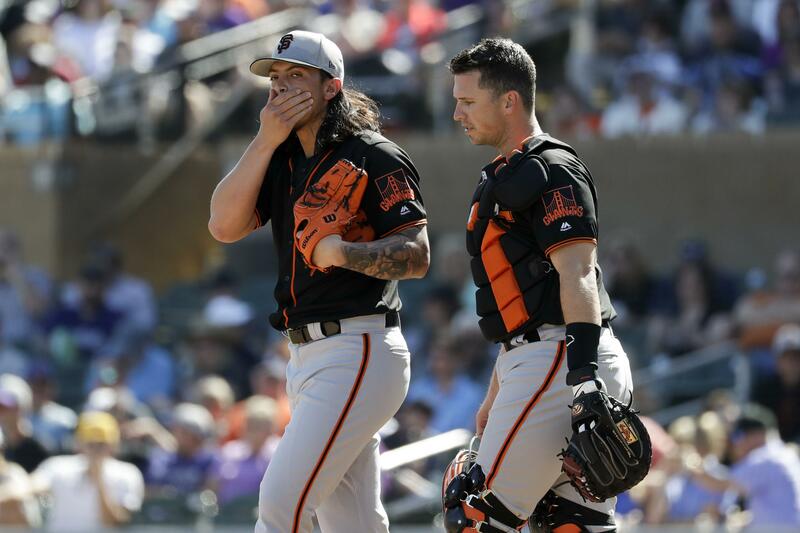 “Buster’s a smart guy,” Giants pitcher Dereck Rodriguez said. “He has a different game plan with every single pitcher. He came up to me in the bullpen before we started warming up and said, ‘Today, we’ll start mixing it up.’ He’ll tell me some of their key players and the ones we want to focus on more than others. NOTES: A year ago, Rodriguez was one of the first players cut from the Giants’ big league camp. On Saturday, he tuned up for the season by striking out five over 3 2/3 innings against the Chicago Cubs in his third spring start. The biggest difference this spring? “I’m still here,” Rodriguez said, looking around the Giants’ clubhouse. “Last year at this time, I was on the other side (in the minor league camp). Now, I know the days I’m pitching. I get to start the games instead of coming in the seventh or eighth innings. I’ve just got my head down and keep doing what I’m doing.” Rodriguez was assigned to minor league camp on March 12 after appearing in three spring games last year. He did start March 21 against the Arizona Diamondbacks and Posey caught that game. “He had the confidence and the poise and the ability to adjust like any good major leaguer has to adjust, whether it’s defensively or offensively,” Posey said. “Because of that, he’s going to be successful for a long time.” Bochy on Rodriguez: “Right now, he’s part of this rotation. I think he’s throwing the ball well.” … The Giants reassigned right-handed pitchers Carlos Navas and Kieran Lovegrove to their minor league camp. With the moves, there now are 55 players in camp plus one on the 60-day injured list. Published: March 9, 2019, 3:39 p.m.